It might take some time to sort out the best roles for the newest Portland Winterhawks. But in the aftermath of a wild Western Hockey League trade deadline, Winterhawks VP/GM/coach Mike Johnston feels good about the way his roster stacks up in what should be an ultra-competitive U.S. Division. With the acquisition of defenseman Dennis Cholowski on Jan. 10, the Winterhawks have four players chosen in the first round of the NHL draft. A mobile defenseman, the 19-year-old Cholowski was the 20th pick in 2016 by the Detroit Red Wings. He joins Cody Glass (No. 6 in 2017 to Vegas), Kieffer Bellows (19th in 2016 to the New York Islanders) and Henri Jokiharju (No. 29 in 2017 to Chicago) as first-rounders on the Winterhawks roster. Three other Portland players have been drafted: Joachim Blichfeld (seventh round, 2016, San Jose), Brendan De Jong (sixth round, 2017, Carolina) and Skyler McKenzie (seventh round, 2017, Winnipeg). As the trade deadline approached last week, Johnston had to weigh the urgency to win this season against what are shaping up to be talented teams for the next couple of seasons. 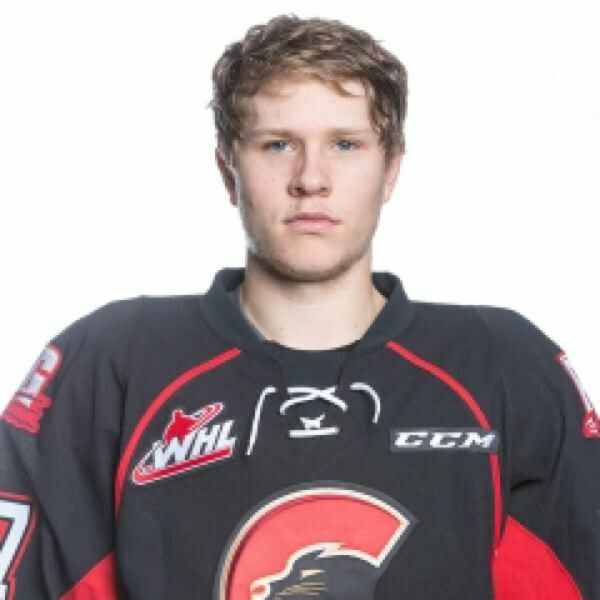 To get Cholowski, the Hawks sent talented 17-year-old forward Ilijah Colina, 16-year-old forward prospect Connor Bowie and four bantam draft picks (including a 2020 first-rounder) to Prince George. Portland also received the rights to 18-year-old Ty Taylor in the deal. A lot to give up for a player who will only spend this season with the Hawks before starting his pro career? Such was the nature of this season's trade deadline, when multiple teams were adding players in hopes of making a long playoff run come spring. The good news? The Winterhawks still have nine picks, including a first-rounder, in the 2018 bantam draft. In Cholowski, they have a mobile defenseman who fits Johnston's puck-moving style and adds leadership. Joining Prince George this season after one season of NCAA college hockey at St. Cloud State, Cholowski was the Cougars' team captain. The 6-1, 200-pound Cholowski said it was tough to say goodbye to his Prince George teammates. He wasn't surprised to be traded, though — Prince George is trying to build for next season — and was happy Portland was his destination. "Detroit wants me to be as offensive as I can," Cholowski says. "Jump into the rush and try to generate points. So Portland being a skilled, fast team, that works out for sure." Cholowski played his first three games with Portland over the weekend — two wins and a shootout loss — without having practiced with the team. When the trade happened on Wednesday, he had time to say good-bye to his teammates in Prince George, drive eight hours with his father to their home near Vancouver, British Columbia, then catch a flight to Portland in time to play for the Hawks on Friday in Kennewick, Washington. Johnston says it is too soon to say who Cholowski will be paired regularly with on defense. "I know he can play a lot," Johnston says. "He moves the puck really well. He's a bigger, stronger guy. Once he gets settled in, he's a good addition for us." The other addition via trade also is a bigger, stronger guy. Lukus MacKenzie (6-2, 203) was acquired for a sixth-round bantam pick in 2020. The 18-year-old power forward brings needed size and toughness to the Hawks' forwards corps. "I think I'm a very versatile player," MacKenzie says. "I'm a big body. When I choose to, I can mix it up a bit. I can hit. I can play physical. But on the flip side, I have an offensive upside, so I can help the team out there, too." MacKenzie made a quick impression. In his first game for Portland, he was in a first-period fight and scored a goal. "That was huge," MacKenzie says. "We have a bunch of guys who can make plays here. That really helps me out, too. Hopefully I can keep some production going." MacKenzie chuckled in discussing his goal, but both he and Johnston say he is capable of producing more offense than he was expected to while playing for Saskatoon and Red Deer. "He's really strong on the puck. He plays physical. He protects it. He's got good hands," Johnston says. "I think when he gets used to the pace of our game he'll be an even better player." MacKenzie, who left Red Deer ahead of the trade deadline and played one game with the Okotoks Oilers, a Junior A team near his home in Calgary, was thrilled by the trade. "(Johnston) is letting me get some offensive looks," MacKenzie says. "He's telling me to have more confidence with the puck and think more about puck possession." n In addition to the new additions, the Winterhawks welcomed back Bellows, Jokiharju and Blichfeld from their World Juniors experience. Since they didn't get the holiday break, Johnston gave them seven days away from hockey after the tournament to recharge. Then they played three games in three nights. They accounted for four goals (three from Bellows) and nine assists over the weekend as Portland beat Tri-City and Seattle and rallied to earn a point in a shootout loss to Everett. n Team captain Keoni Texeira returned from injury, too, bolstering the defense and penalty-killing unit. However, the Hawks were shorthanded at forward with Lane Gilliss and Jake Gricius injured. Neither injury is long-term, good news for a team that played defenseman Conor MacEachern at forward to fill out the lineup. "Those are good veteran guys for us," Johnston says of Gilliss and Gricius. "They give us good penalty killers. They give us an extra line that we need." n This will be another busy week, as the Hawks play four games in five nights. They play host to Victoria on Wednesday and to Swift Current on Friday in the coliseum, travel Saturday to Vancouver, then are back on Sunday for a home game at Moda Center against Brandon. Swift Current and Brandon are second and third in the tough Eastern Division. Vancouver and Victoria are second and third in the B.C. Division. The Brandon game will be the return to Portland for Evan Weinger. Weinger played three seasons for the Winterhawks (scoring 37 regular-season goals). He has 19 goals and 17 assists in 35 games for Brandon. He was sent to Brandon at the start of this season because Portland was over the limit of three 20-year-olds. Portland's overage players are Texeira, goalie Cole Kehler and second-line center Alex Overhardt, who scored his 10th goal of the season on an effort play in the Jan. 9 win at Seattle. Overhardt is a key faceoff guy (winning 58 percent) and penalty killer.